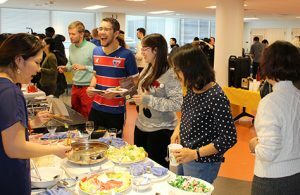 The International Students Office (ISO) collaborated with multiple cultural student groups to bring the MIT community a new IAP event on January 30: Table Etiquette Around the World. MIT Video Productions also filmed this event, where visitors were invited to pick up a “passport” and “travel” to each country (table) to learn about the proper etiquette for eating in that particular culture. The objectives included teaching visitors how to eat in both a formal and more casual setting so that during any future travel to that country, they will be able to utilize their table etiquette knowledge, as well as avoid possible embarrassment. If visitors collected at least 5 “stamps” for their passport, they could be entered into a drawing for several prizes. Twelve countries/cultures displayed their rules of proper etiquette; each table also offered a taste of its culture with a typical snack or drink. In Iran and Armenia, we learned that if you say “no” to more servings, your “no” actually means “yes” because the host will assume you are being polite. At the Japanese table, we discovered that placing your chopsticks upright in your rice is considered taboo. The Italian students taught the proper way to eat spaghetti and shared that in Italy you should eat pizza with your hands; in most of Europe, a knife and fork is used. Also represented were China, the Caribbean (St. Kitts and Nevis and Haiti), Eritrea and Ethiopia, India, South America (Brazil and Chile), South Korea, and Vietnam. In addition, a collection of world music played in the background as photos of delicious foods and beautiful scenery from around the globe looped continuously on two TV monitors. More than 150 members of the MIT community stopped by to experience this interactive and informative IAP event.